Springtime! 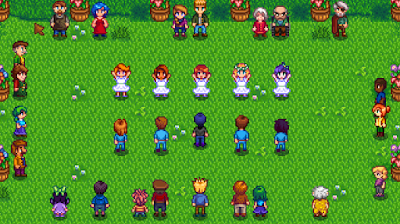 It’s a time of renewal and romance, and nothing in Stardew Valley better encapsulates those themes than the Flower Festival. A relatively simple little shindig, the Flower Festival is nevertheless the clearest way to declare whom you’re going to marry by the end of the game. … or you could have a FOREVER ALONE moment. Your call. The Flower Festival takes place on the 24th of Spring every year, at 9 am. You’ll find the grounds on the same screen as Marnie’s Ranch, south of your farm, in an area you can’t normally reach. … buuuut you need to have five hearts’ worth of affection with one of the bachelors or bachelorettes prior to the Flower Festival. You’ll need to complete quests and give gifts to get this high. 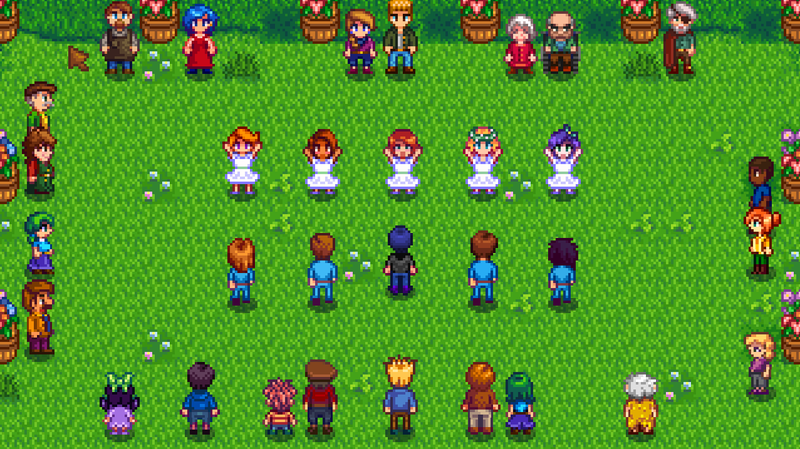 Assuming you can achieve at least five hearts with one of the ten single folks (Penny, Maru, Haley, Abigail, Leah, Sebastian, Elliott, Alex, Harvey, and Sam) you can proposition them before the dance. Speak to Lewis to get the dance underway, whether you’re joining in or not. The Flower Festival ends after the dance is complete, and you’ll be shunted back to your house at 10 pm.